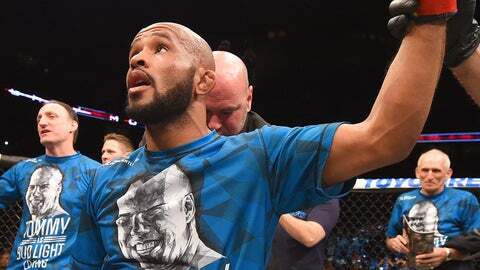 Demetrious Johnson doesn't care who he makes history against, so long as he makes it. Flyweight world champion Demetrious Johnson is finally letting loose outside of the cage, the way he does in his constant-motion, always exciting bouts. So, he didn’t mince words with reporters, recently, when they asked him who he wanted to defend his belt against next. "I don’t give a damn," Johnson said. "I just want to fight … I’ve never turned down a fight." What Johnson does care a lot about is breaking Anderson Silva’s record for most consecutive UFC title defenses of 10. Currently, Johnson’s mark sits at seven consecutive successful defenses of his UFC 125-pound title, tied for fourth place with Jose Aldo for consecutive UFC title defense wins. Of course, fight fans need to remember that world title reigns like that of Jose Aldo’s at featherweight, began long before the UFC brought him and his talent-rich weight class into their fold. Before his WEC title was turned into a UFC one, Aldo had already been the undisputed world champion at featherweight for about two years and two defenses. So, Aldo has defended the true world title nine times, tying him with former welterweight champ Georges St. Pierre for second, behind Anderson Silva. Similarly, Ronda Rousey’s women’s bantamweight title was turned into a UFC title in 2013, but she had already been the recognized world champ at 135 pounds after she defeated Miesha Tate for the Strikeforce belt in March of 2012. Rousey defended that world title for the first time in Aug. 2012, almost a year before it became a UFC one and she defended it against Liz Carmouche, and so if you’re looking at total world title defenses, in or out of the UFC, Rousey has seven consecutive successful ones, instead of the six she is often credited with. While we’re on the subject, it should be noted that while Silva only gets credit for 10 consecutive successful middleweight title defenses during his reign, he actually beat middleweights 11 consecutive times during his run. His first title defense against Travis Lutter actually ended up not having the belt on the line because Lutter did not make weight, so he was not eligible to win the championship afterwards. Silva still chose to fight the heavy Lutter, and submitted him in the second round. If the world were fairer, Silva’s win against Lutter would be considered among his title defenses. Still, all of that having been said, Johnson is shooting for Silva’s nice round number of 10 official consecutive title defenses, and he doesn’t much care who he has to beat to get there. "People are saying Joseph [Benavidez] might be next, which is fine," Johnson continued. "I want to fight whoever is going to get me to that number — breaking the record for title defenses … I’m a competitor." After already having decidedly dispatched with perhaps his closest competitors, (Benavidez, John Dodson and Ian McCall), Johnson may be well-positioned to tie or break that mark of Silva’s. Even if potentially dangerous challenger Henry Cejudo is next in line, he may not get a crack at Johnson if the fight is offered in Nevada since the Olympic gold medalist has said he will refuse to fight in the world’s fight capital of Las Vegas in protest of Nevada’s strange handling of Nick Diaz.